Nadine Thomas and her hapuka with Shannon Maxfield and Emma Priest. 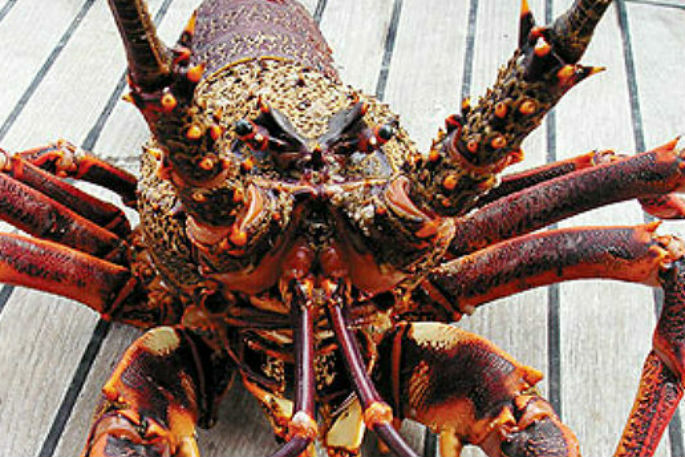 Every February for more nearly 30 years a unique event has been held off the pristine waters of the Coromandel Peninsula. Whangamata Ocean Sports Club proudly promote their Nauti Girls fishing competition as “the largest ladies only fishing competition in NZ… probably”. In February the hugely popular event saw 561 anglers competing on 184 boats chasing a prize pool hitting $45,000, with the after-party evening event attracting more than 1000 people in the marquee. Club manager Phil Keogh says the Nauti Girls is the party event of the year and the one they look forward to the most. “It is the funnest event and our largest event angler-wise,” says Phil. The fishing area was between Mercury Island (north), Motiti Island (south) and unlimited to the east. Phil says two teams tagged and released striped marlin within the time restrictions before the weigh-in and another missed the cut-off with a 139.3kg beauty. A social highlight of the celebrations was the Fashion in the Field competition with many of the teams dressing up for the occasion. Among the happy fishers was Team Stingray. 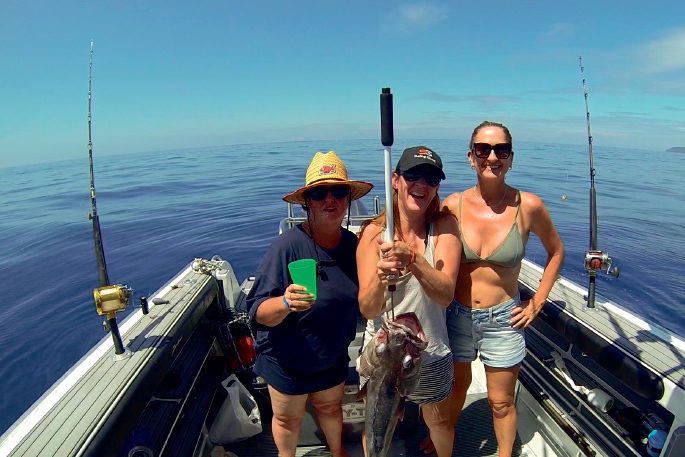 While Tauranga’s Nadine Thomas and her team of Shannon Maxfield, Jill Agnew and Emma Priest, with trusty boat captain Bryan “Beanz” Grafas, did not get to tag and release a striped marlin, they had a great day. “It is the first time our team has got back together in 11 years to compete in this event after we entered it for four years,” says Nadine. “Shannon I have known since I was about 11-years-old and she is into fishing as well. Another girlfriend Emma I have known for about 25 years and she lives in Aussie and came over specially for it which as awesome. The costumes got plenty of attention with Nadine’s team dressed as stingrays. “We sourced blue capes and Jill did a great job. She sewed a stingray tail on to it and glued blue dots on. I sourced some swimming goggles that are blue, turquoise and white so they are going to be our stingray eyes. Nadine says the Nauti Girls is a wonderful opportunity for women to give fishing a go. Team Stingray caught loads of fish, including Nadine’s personal highlight of a large hapuka, but it was not to be their lucky day out on the water. “I was really stoked about catching the hapuka. But it was not on the rules sheet as one of the fish you could weigh in so we were a little bit gutted about that. There was never any doubt that Nadine and her two brothers would love being on the water. Her earliest memory is when her dad came back from a day’s fishing in Raglan. Her parents Neil and Barbara Thomas have a lifelong passion for the sea. You have to be dedicated to spend three years on an adventure most boaties would love to do at some stage in their lives. They sailed on their purpose-built 53-foot trawler Starlight through the South Pacific to Japan and onto the Aleutian Islands in the Bering Sea and Alaska from 2002 to 2004. Barbara put the adventures together in a fascinating book called Into the Midnight Sun which she self-published in 2011. She describes the extraordinary places and wildlife they encountered including undisturbed remains of WWII Japanese submarines and grizzly bears gorging themselves on salmon. “It is all about the history of how we got into boating and then the trip of course and all the amazing people we met along the way,” says Barbara. She says looking back now it was something pretty special to have achieved. Barbara also has fond memories of competing in the Nauti Girls fishing competition. “Yeah that’s something I used to do. I was in a women’s team out of Tauranga for some years.